image submitted by Kurt Dalziel of Wind Lake. This looks pretty cool. The Wisconsin DNR is going to work with the state's citizens on what will be the largest trail-cam project in the world. They expect to deploy 3-4000 of the cameras across the state. The people themselves will be responsible for uploading the photos to a website where anyone will be able to see them. All this leads me to wonder, will they get a Bigfoot on film? These are the types of projects we need in order to cover large areas of land for long periods of time in order to attempt to capture a Sasquatch in its native habitat. The Department of Natural Resources and University of Wisconsin have announced a citizen-science project to monitor wildlife in Wisconsin. Named "Snapshot Wisconsin," the project will deploy 3,000 to 4,000 trail cameras across the state. The state will provide the cameras to citizens, who will be trained on installation and use of the cameras and responsible for uploading images to a website. 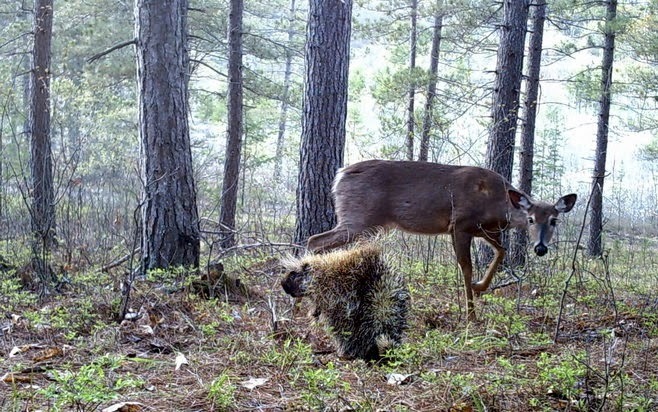 The public — worldwide — will then be asked to help identify animals captured by the trail cams. The information will be used to help monitor wildlife distribution and used to assist with population estimates. Satellite data will also be integrated. The project is scheduled to begin this summer on a pilot basis in several counties and with some school groups. Statewide implementation is planned in 2015. Jennifer Stenglein, DNR wildlife research scientist, is leading the project. Visit dnr.wi.gov/topic/wildlifehabitat/research/citizenMonitoring.html to learn more.